Baseline Transparent Plastic Goniometers, manufactured by Fabrication Enterprises, are very handy tools in measuring range of motion. Each with two arms for measurements, different lengths, and gradation increments, there is a goniometer suitable to the job at hand. Range of motion is determined by placing the head of the goniometer over a joint's axis of motion then measuring the second arm relative to the stationary arm. Often used in physical therapy, goniometers can be used to precisely calculate a limbs range of motion. Used before and after physical therapy, therapists can quantitatively chart a patient's progress. Make consistent, accurate assessments regardless of the nurse, doctor or therapist taking the measurement with this medical tool. 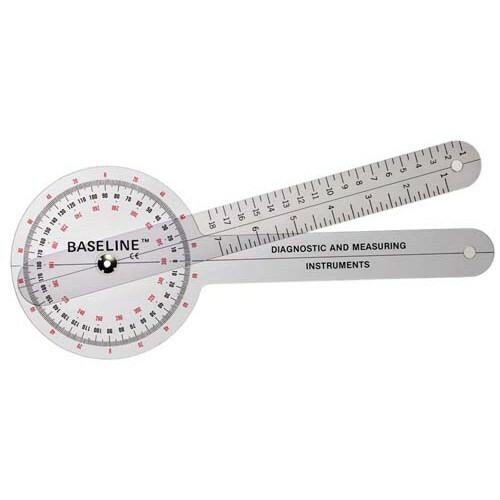 Baseline goniometers are expertly manufactured with physicians in mind. The transparent plastic allows more accurate placement and easier reading of range of motion measurements. Both 360 degree and 180 degree measurements with 6 inch to 12 inch arms are available. Handy little goniometer. Just what I was looking for.